The EPFO always tries itself to provide best services to its employees and employers that will definitely pave a way for the good understanding between the industrial workers and employers. It keep on making changes to the existing services and also introduces new services for the welfare of its people. It also make sure that the women get special benefits through the organization and the special care is taken while providing services to those who are physically challenged and cannot work anymore. The three Social Security Schemes provided by the EPFO concentrates on the employees in the industrial workers and the establishments as such. The employee provident fund organization offers various types of services to various types of people and designations like employee, employer and many more categories. Its services mainly include services to employees, services to employer, services for international workers, pensioners, locate an EPFO office, who’s who. Online Registration of Establishment : The new employer can get their establishment registered through online and once they get registered their establishment the new employer need to get their digital signature registered with the officials. 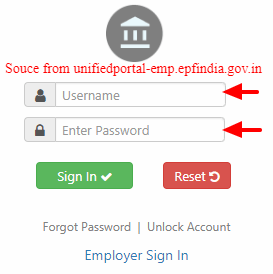 Online ECR / Challan Submission / OTCP : Here you can have online transfer of provident fund and also check the status of the transferred fund. EPFiGMS (Register your Grievance) : with this service you can have your complaint registered and as such can check the status of the complaint filed. TRRN Query Search : Temporary Return Reference Number is used for the employees as a reference for the online challan of the PF amount. Each of the above stated services provided are available to the employers through online and they can access from anywhere and at anytime. Member Passbook : member passbook will have all the credentials regarding the entries of PF of the members. Changes in the passbook will take place only after 6 hours of the activity. Member UAN/Online Service (OCS/OTCP) : One can apply for membership through online and then login into it through the specified user id and password as such. Know Your Claim Status : You will be able to find the status of your claimed Of amount through online by using this website so easy. Hope the article is informative and has survived your requirement.